2011 Atlantic Hurricane Season: 120 days to go! The first 60 days of the Atlantic Hurricane season are coming to an end. On 30 July 2011 there are plenty of signs of potential cyclonic activity throughout the northern hemisphere tropics. 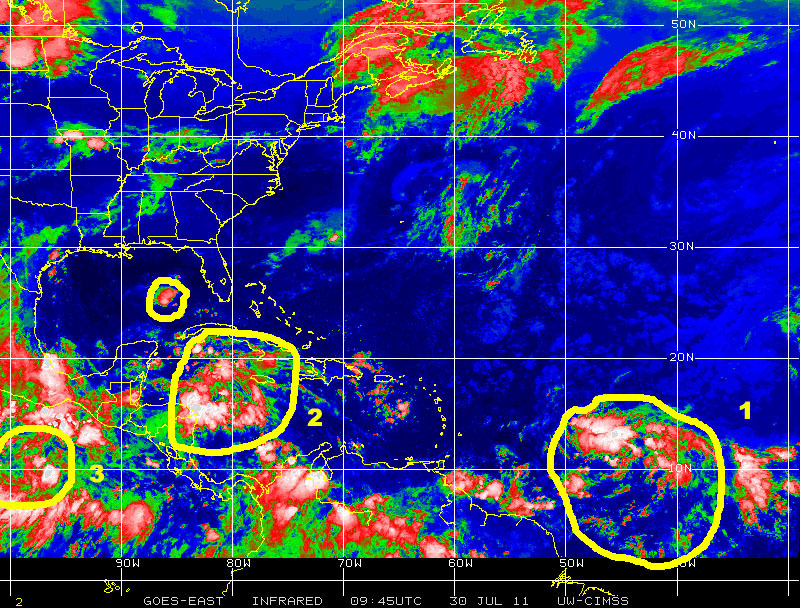 On the satellite image above we can clearly see a large tropical wave in the Caribbean off the Nicaragua-Honduras border, also one large tropical wave that is showing signs of organization and further strengthening to the east of the Lesser Antilles in ‘Hurricane Alley’ followed by another tropical wave to the east. Color-enhanced infrared GOES satellite image on 30 July 2011 showing a Caribbean tropical wave near Cape 'Gracias a Dios' on the Nicaragua-Honduras border, and a large tropical wave in 'Hurricane Alley" about 1000 kilometers to the east of the Lesser Antilles, which is showing signs of potential cyclone development in the next 24-48 hours. Farther to the east over the eastern Atlantic and equatorial Africa we see the ‘Tropical-wave assembly line’ has gotten much better organized over the past couple of weeks and it is now showing regularly spaced pulses of tropical weather activity that will become tropical waves feeding into ‘Hurricane Alley’. Previous Post29 July 2011: It is 3 + 2 !Next Post1 August 2011: Hurricane Alley is full of traffic!